"I tried to scan and rip DVDs on a Windows with Handbrake.Either there won't be any titles available for selecting after HandBreak scans the disc or only a few are there, but they're not the main title/feature. What am I missing?" "I've been ripping my DVDs to h.264 using Handbrake. It's been going great, but sometimes Handbrake just doesn't get the job. I just tried The Nightmare Before Christmas, and Handbrake doesn't see the titles w/ the actual movie in it. It just sees extras and stuff." Why Handbrake not showing all DVD titles and how to fix it? Case 1 and solution: Your Handbrake is too old to work with the new DVD disc. The current version of Handbrake is 1.1.2. Therefore, just go to https://handbrake.fr/ to download and install the latest version of Handbrake for ripping your DVD. Case 2 and solution: There are certain parts on your DVD disc is damaged or scratched. Try to find a reliable program to repair your DVD disc before loading your DVD disc into Handbrake for ripping. Case 3 and solution: Your DVD disc are copy protected. Sometimes, even you have installed the latest version of Handbrake, the title not showing mistakes may still exist. The main reason is that does not circumvent copy protection. The solution is that you can remove encrypted DVD with CSS protection using Handbrake by installing VLC, a media player application that includes the libdvdcss library. Currently, make sure to install latest version of libdvdcss. The problem is that most commercial DVD may be protected with not only CSS protection but also other complicated protection types such as region code, RCE, key2Audio, UPP, Macrovision, Protect, Arccos, AACS+, bd+, etc. Obviously, install libdvdcss with Handbrake will not solve the problems completely. Other people recommend to decrypt DVD free with MakeMKV, which will only give you the main movie as output when working with DVD and the output will be in an uncompressed mkv file. This mkv file can be imported into Handbrake for compression and conversion. It may be a great hassle for you to bypass DVD copy protection with one program and perform the video format transcoding process with another application. If you are looking for one stop solution to fix the problem, we highly recommend Pavtube ByteCopy to you. The program not only assist you to powerfully remove all DVD copy protection listed above in the background, but also allows you to copy or backup DVD movies in the way you want. You can make a 1:1 full disc copy with original file structure, a main movie copy without unwanted ads, trailers or comments or DVD to lossless multi-track MKV with desired subtitle languages and audio tracks. You can also select to rip DVD to various popular digital file formats such as AVI, WMV, MP4, MOV, MKV, FLV, 3GP, H.264, H.265 or specific devices preset profile formats with the optimal playback experience. As for the title issues, the program will scan the DVD disc, in just 2-3 seconds, all the titles will be displayed on the main interface, it will also check the main title (the long with the longest time and largest file size). Download, install and run this DVD ripper. You can load DVD by clicking "File" > "Load from disc". Or load DVD Folder by clicking "File" > "Load from folder" or load DVD IFO/ISO image by clicking "File" > "Load IFO/ISO". On the main interface, all the DVD titles will be displayed, the program will select the main title for you automatically. Step 2: Different ways to copy and rip DVD movies. On the top tool bar of the main interface, use the option to make an entire disc copy of original DVD structure without changing anything. From "Format" bar drop-down list, select "Copy" > "Direct" Copy, you can then copy the selected movie file in its original format without quality loss. When directly copy a DVD video, you will get .vob as output. 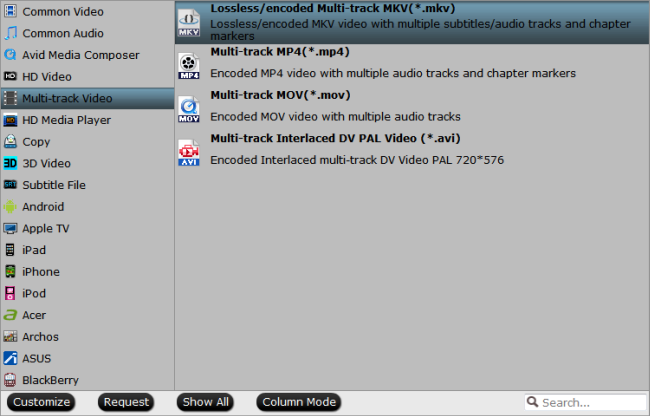 To preserve all your wanted audio tracks and subtitles streams in the source movie, you can use the program to rip DVD to " Lossless/encoded multi-track MKV(*.mkv)" under "Multi-track Video" category. Here, select the output digital file format according to which devices you plan to play DVD movies with bad sectors on various portable devices. 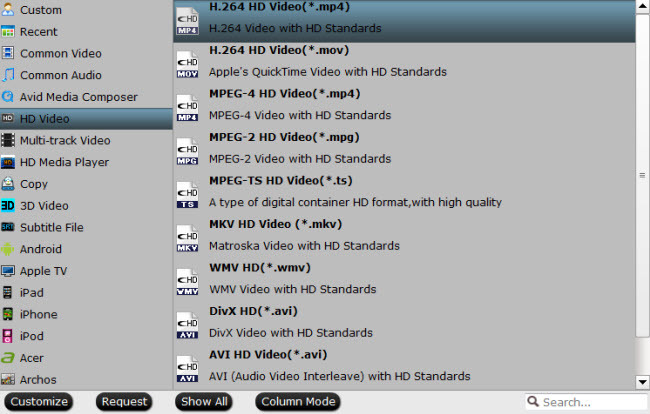 Here, we choose one of the best compatible digital file formats "H.264 HD Video(*mp4)" under "HD Video" main category. Step 3: Start DVD backup/ripping process. 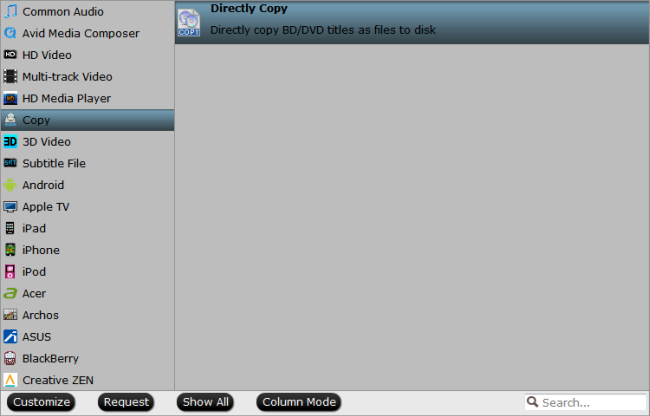 After all setting is completed, hit the "Convert" button at the right bottom of the main interface to begin DVD movie copying or ripping process. When the conversion is finished, click "Open Output Folder" icon on the main interface to open the folder with generated files. Then you will produce a digital file for either safe backup or convenient device playing.